This week’s Design Blitz forced me to take a deeper look into pictures and art that is around me and that I see every day. All of these photos were taken of art that I walk by on a daily basis. The first photo is of a piece of ivory artifact that is in my parent’s house. It is hard to believe but this ivory artifact was carved out of a single piece of elephant tusk, but the overall size, profile, and outline as an uncarved piece of tusk. 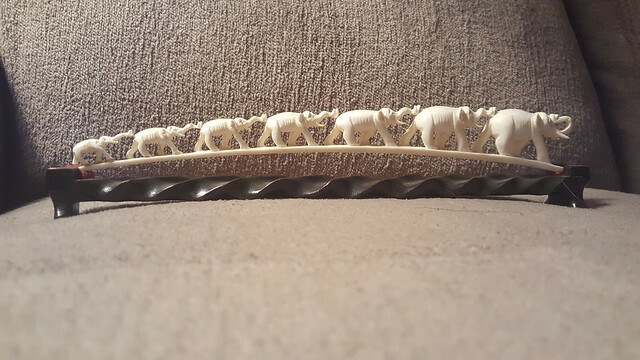 The tusk was hand carved, without a single elephant removed, as every elephant is attached to the in front of it. Notice how each elephant has its trunk up. The elephant’s trunk up is a traditional symbol for good luck for any passerby. Elephants are also a symbol of power, strength, and royalty. I am neither royalty, nor am I sure if the good luck has helped any, but it is a very nice piece of art finely crafted. 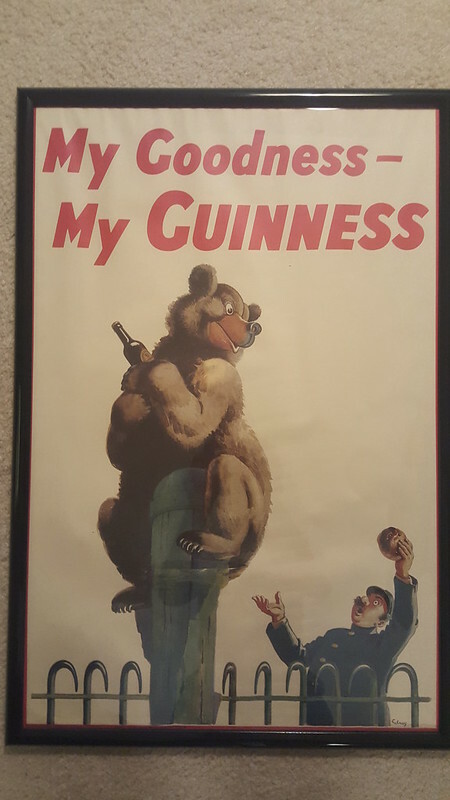 This is a vintage Guinness poster that is hung up in my room. I received it from my rugby director after doing some work with him, and apparently it had been hung up in a bar in Ireland. This poster is from a early 1950’s advertisement campaign that features a zoo keeper and the animals from the zoo. Nearly all of these posters include the slogan, “My Goodness, My Guinness!”. This poster sends a clear message about that Guinness is so good, even the animals will want some. This poster applies the literal meaning of message, as it has the slogan at the top of the poster, and the figurative as the audience needs to create their own meaning and application of this poster. 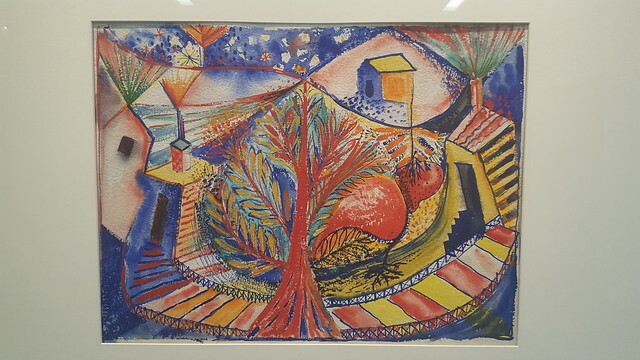 This is a watercolor painting by Margaret Sutton, born in a rural southwest VA town in 1905, she attended what was then called Mary Washington College and then later Hans Hoffman’s art school in New York, where she spent much of the rest of her time. Her work is surrealist and features influence from her life experiences. This particular piece was painted in the 1940’s and is untitled. The focus of this piece is in the center on the red tree. Immediately noticeable are the bright colors chosen. This painting uses only four main colors being blue, red, yellow and a little bit of green. This painting also features symmetry, as the centerline of the tree acts as an inflection point, having the horizon change direction and go back up the painting. Many of her works are a similar style, featuring eccentric patterns and designs with equally bright colors. 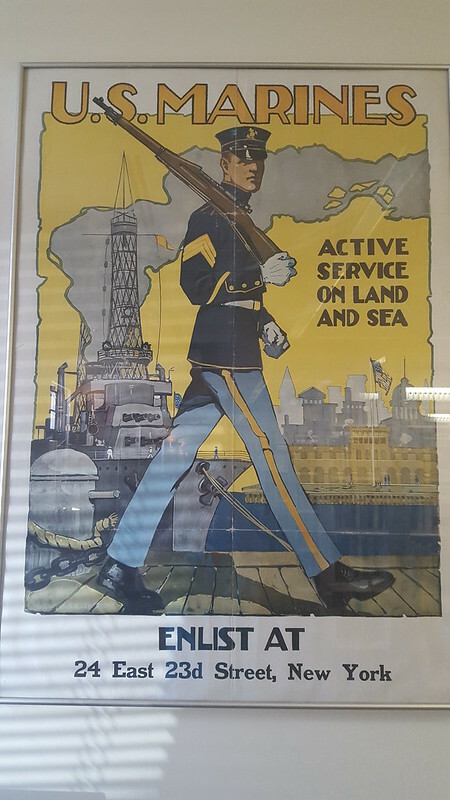 This is a World War One recruitment poster for the US Marine Corps. The artist for this piece was Sidney Reisenberg from 1917. The main feature of this poster is dominance. At this point in history, the US was not the political and economic powerhouse it is today. This war was proof that the US could compete with its european counterparts. The large, front and center marine with his rifle in the foreground, and in the background the Naval ship and the American buildings further back are all working symbiotically to create a feeling of dominance and patriotism. The strong, bold typeface also works to help convey the feeling of strength, power, and dominance. This poster wants to make you feel as if you are being yelled at to enlist by the strong, dominant and masculine voice inside your head. That would not work with a light, wispy cursive font.